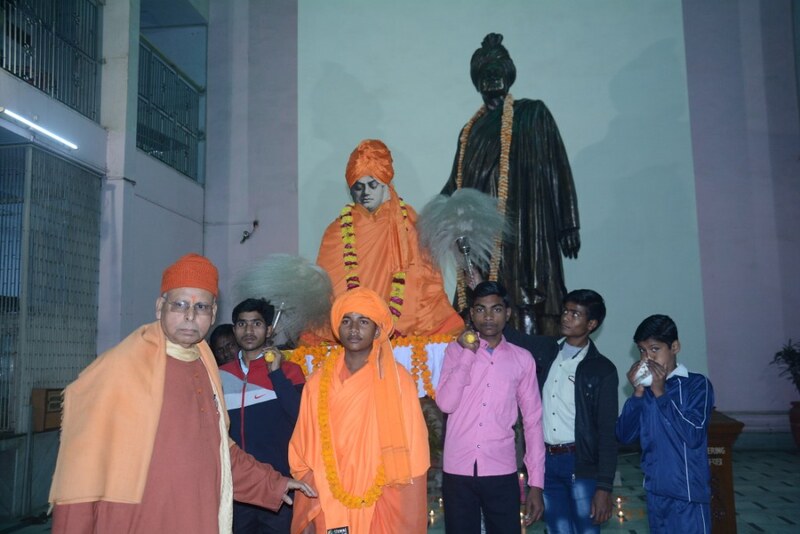 Ramakrishna Math & Ramakrishna Mission Sevashrama, Lucknow, celebrated the National Youth Day on 12 January 2019. The Ashrama conducted various programmes on this occasion. The day started with Rogi Narayan Seva – Worship of God to patients admitted at Vivekananda Polyclinic & Institute of Medical Sciences, Ramakrishna Mission Sevashrama, Lucknow with distribution of fruit and biscuits sponsored by Bharat Vikash Parishad, Lucknow from 9:00 a.m. to 10:00 a.m.
A colourful procession, flagged off by Prof. Vikram Singh, Pro-chancellor Noida International University and Former DGP, Uttar Pradesh, started from the Police Lines ground besides IT crossing, Nirala Nagar, Lucknow at 10:00 a.m. The procession was led by a school band comprising of more than 600 youth from various Schools and Colleges – Saraswati Vidya Mandir, Ramadhin Singh Inter College, Police Modern School, M.D. New Indian Public School, The Rising Sun Academy, branch of Gadadhar Abhyudaya Prakalpa, Lucknow & Katra Bakkas, and Vivekananda Yuva Sangha, School, S.D.S.N. Group of College B.K.T., Lucknow, N.K.M. Inter College, Lucknow, Nobel National Academy, Lucknow and others with various banners, festoons and tableaus. 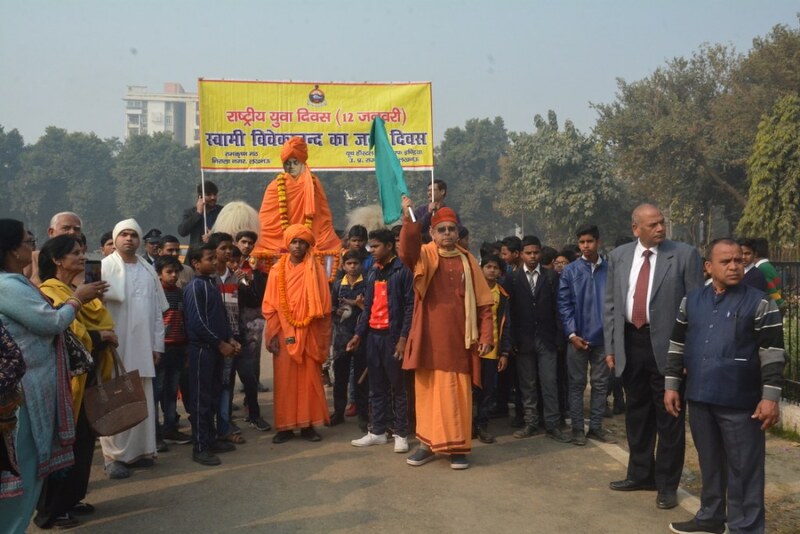 The procession with a tableau of Swami Vivekananda & a young boy dressed as Swami Vivekananda visited Vivekananda Polyclinic & Institute of Medical Sciences, Lucknow and finally was concluded at Ramakrishna Math, Nirala Nagar, Lucknow. A special youth programme was organized at the Math. The programme started with Lighting of Lamp followed by Vedic Chanting by Brahmacharins & childrens of Gadadhar Abhyudaya Prakalpa, Lucknow. The youth sang the Swadesh Mantra and Amrit Mantra . The welcome address was given by Swami Dharmapalananda, Ramakrishna Math, Lucknow. Short speeches and recitations were presented by the selected youth participants. Prof. Vikram Singh, the Chief Guest addressed the audience on the Significance of National Youth Day. 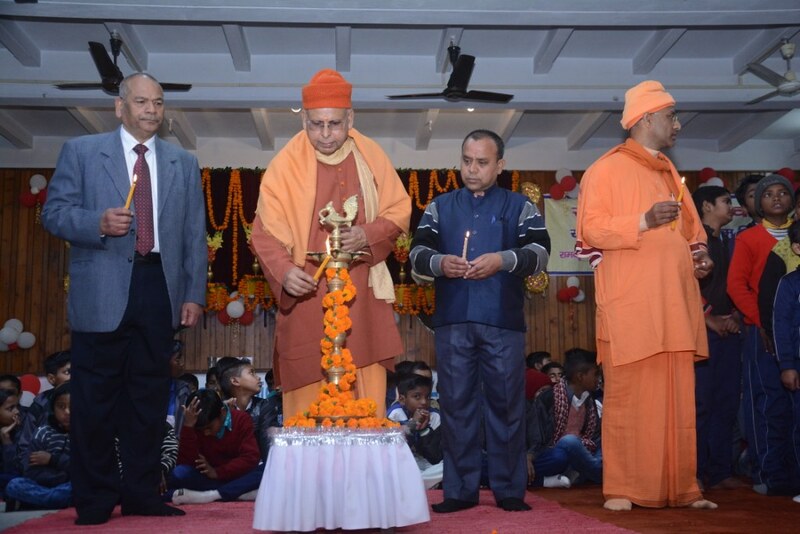 The Presidential Address was delivered by Swami Muktinathananda, Adhyaksha, Ramakrishna Math, Lucknow. Sri Rajesh Verma, Vice President, Youth Hostel Association of India, Lucknow presented Vote of thanks. The programme concluded with the closing song on Swami Vivekananda followed by National Anthem and distribution of literature and food packets to all present. In the evening, a special programme was organized by the Students of Vivekananda College of Nursing and Vivekananda Polyclinic School of Nursing, Lucknow from 4:30 p.m. to 6:00 p.m. After the Lighting of Lamp followed by Vedic Chanting by the nursing students, Swami Muktinathananda, Secretary of the Institute presented the welcome address and inspired the youth. 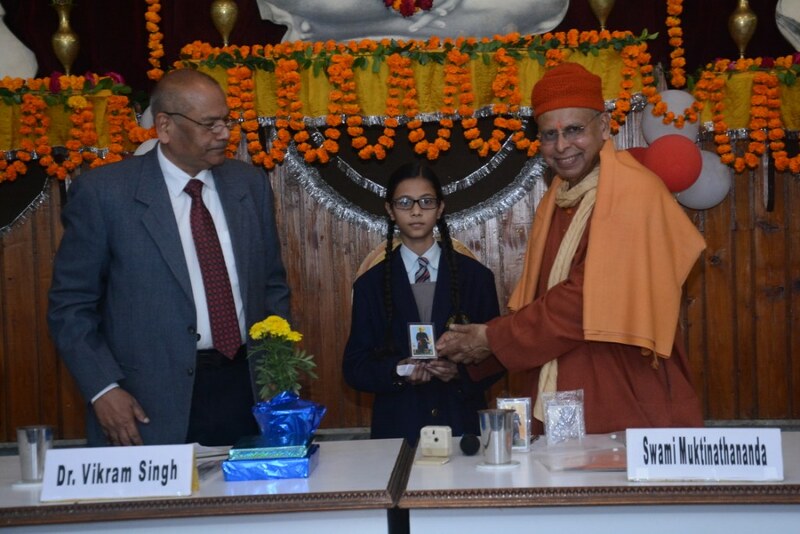 The students recited Swami Vivekananda’s poems, utterances and sang songs and narrated his short life. Dr. Vikram Singh, Pro-chancellor Noida International University and Former DGP, Uttar Pradesh, the Chief Guest of the function, spoke on this occasion.